I had the privilege of reading an early copy of this novel last year, and my first thought after finishing it: EVERYONE NEEDS TO READ THIS BOOK. There was a constant flow of admiration for Julie Murphy's writing as I read page after page, thinking WOW, this is her debut?! Her ability to make me think beyond the pages is a testament to her craft. This story is rich with emotion and consequences, flooded with humor and wit. 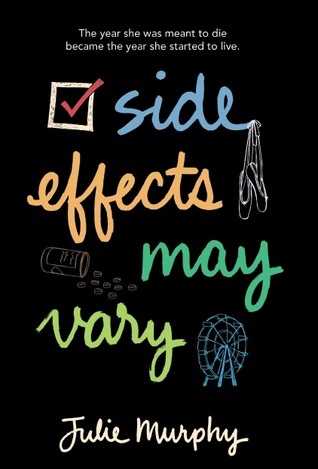 SIDE EFFECTS MAY VARY encompasses a lot of what makes contemporary YA so compelling for this adult reader. The emotions it conjures up are unforgettable, leaving behind a slue of tears and echos of laughter. Alice thinks she's dying. In fact, her doctors have told her she doesn't have much time left. So instead of conquering a bucket list of inspirational moments, she creates a list of wrongs she wishes to right. The only problem is that these wrongs have ugly consequences. However, since Alice has been given an expiration date, she figures she won't be around for the aftermath. But then life plays a funny trick on her, giving her a second chance, and all those wrongs she didn't see through are now staring her in the face. The biggest consequence belongs to her best friend Harvey, and coming to terms with the truth about her true feelings for him. There's a spark of raw honesty and ruthlessness in Alice's character that drew me in, causing me to really despise who she was. It was downright dirty in some parts. But there was also a fire in this girl, refusing to be extinguished, not even by Harvey. Oh Harvey. This boy captured my heart from the first few pages he is introduced and caused my heart to swell even in the moments that I just wanted to wrap him inside a warm hug. There are scenes in this novel that resonated deep within my teenage self. It took me back to a time of belonging and what it means to find your place among people who hold influences in your life, whether you want them to or not. Julie Murphy tells a story that is both heartwarming and heartbreaking, littering the pages with words that are impressionable and poignant. I highly recommend this contemporary YA to readers that welcome thought provoking stories that cause them to feel long after they've finished reading the last page. I'm very excited to read SIDE EFFECTS MAY VARY! It sounds like it's a strong contemporary YA, and one that deals with honest, authentic characters. I remember you talking about this one last year, and I'm still excited about it now! I don't think we've ever talked about it, but I really liked Side Effects May Vary (not a 5 star read for me, but a very solid 4). As much as I found the story really interesting and loved Alice as an antihero, I was just so, so impressed by Julie Murphy's writing. Like you said, it's insane that this is her debut. I'm dying to read more from her, I think I have to wait until 2015, right? Very sad news! The writing on this one is KILLER. I don't know how I feel about Alice & Harvey still, but the writing! LOVE!